An aristocratic, traditional hotel in a beautiful corner of Mayfair, Brown's Hotel lies close to the boutiques of Bond Street and to the Royal Academy of Arts. The afternoon tea is legendary, service impeccable at this traditional Mayfair hotel. Rocco Forte Brown's Hotel is an aristocratic, traditional hotel in a beautiful corner of Mayfair. Brown's has always had excellent staff and an impressive kitchen, but the hotel has stepped back into the top ranks following a long overdue refurbishment in 2005. The old Brown's values of style and service are now married to modern comforts and facilities in the rooms. The afternoon tea is legendary, food is the best of modern British cooking, courtesy of celebrated chef, Mark Hix, the service impeccable, and regular guests find it reassuring to see that the rooms are reminiscent of other Rocco Forte Hotels in the understated elegance of the decor and soft furnishings. Right beside Bond Street, the hotel is in a great location to walk to Selfridges, Fortnum & Mason's and the Royal Academy of Arts. A wonderful five star experience. Queen Victoria loved to take tea at Brown's. 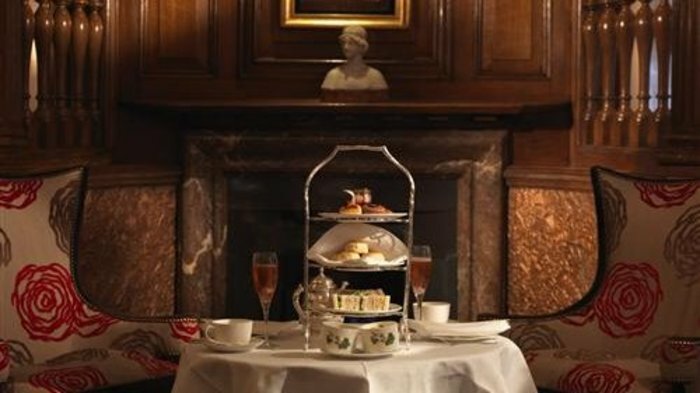 Queen Victoria loved to take tea at Brown's, a wonderfully traditional Mayfair hotel where the afternoon tea is legendary. Established in 1837 for genteel folk, James Brown's charming hotel instantly became synonymous with the refined tradition of afternoon tea. A popular haunt of royalty and statesmen, the hotel has also attracted and inspired a number of famous guests. Graham Bell made his first successful British telephone call from Brown's in 1876, Rudyard Kipling wrote 'The Jungle Book' here and regular visitor and author Agatha Christie based her book 'At Bertram's Hotel' on Brown's. Lord Byron who once described the hotel's founder, his former valet, as the "gentleman of gentlemen", also supped in these elegant surroundings. The English Tea Room is a wonderfully refined, discrete setting from which to enjoy a choice of teas - there are more than 17 teas, including Brown's own blend, to choose from - finely cut sandwiches, freshly baked scones, Brown's famous home-made jams and clotted cream, and a selection of cakes and delicate pastries. Sink deep into an armchair, relax in front of the fire to the sounds of a piano, enjoy your chosen blend of tea from fine Wedgwood porcelain and select your desired delicacy from a Victorian silver tea-stand as you form part of history at Brown's. Mark Hix oversees the food - seasonal British dishes served in a beautifully restored wood-panelled room. With Mark Hix, formerly at the Caprice group and a chef well known for his original take on British gastronomy, overseeing things and with Lee Streeton as executive chef, Hix Mayfair at Rocco Forte's Brown's Hotel is a very British restaurant, serving seasonal dishes in the beautifully restored wood-panelled room. Tradition meets the modern world through the restaurant's colourful banquettes and artworks by leading British artists, including Tracey Emin, Michael Landy, John Rankin, Fiona Rae, and Tim Noble and Sue Webster. The freshest and most seasonal ingredients are used to create a menu of frequently changing dishes including Wye Valley asparagus, monkfish curry, and baked fillet of cod with white sprouting broccoli and Morecambe Bay shrimps. Branded "the epitome of civilised, non-flashy English comfort" by Harpers Bazaar, Hix Mayfair is next to the Donovan Bar where black and white fashion photographs by Terence Donovan adorn the walls. "The ground floor is full of chatter and buzz and remains highly popular for its afternoon teas," writes Fiona Duncan in The Telegraph. An example of all the things a classy hotel bar ought to be. For those who like Gucci with their champagne, the Donovan Bar is an example of all the things a classy hotel bar ought to be. The understated bar is punctuated by more than 50 striking black and white Terance Donovan prints, the British photographer after whom the bar is named. Choose from a long list of expertly mixed cocktails or an equally engaging selection of champagnes, then, find a seat in one of the smooth black leather seats. Order a signature Donovan Martini and take a seat in the 'naughty corner' where Donovan's more risque pictures look down on you. Alternatively, sit beside the original 19th century stained glass window of St George in one of the coolest bars in London. Either way you can't argue with the super competent, discreetly polite staff in their impeccably clean white jackets. From cheap budget hotels to luxury 5 star hotels see our special offers for hotels, including Holiday Inn Express London Greenwich from 33% off.